This recipe comes from The Tomato Book, which happens to be shaped just like a tomato. I hate to admit this, but I enjoy these cheesy cardboard cookbooks by Publications International, Ltd. Their dumb shapes make me happy, and much like the old Pokémon fad, I gotta to catch ‘em all. It helps that the recipes are usually simple, because really, you can only fit so many instructions onto one little page. On brain fried days, I can grab one of these no brainer beauties, pick any recipe, and get cooking in no time. 2. Heat 1 Tablespoon olive oil in a medium nonstick skillet over medium high heat. Add half the polenta slices to skillet; cook until golden brown on both sides, about 4 minutes, turning once. Remove polenta from skillet. Repeat with remaining oil and polenta slices. 3. 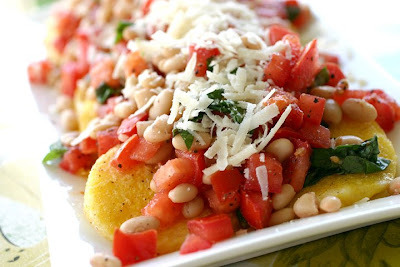 Arrange polenta on a serving plate. Spoon tomato-bean mixture on top. Sprinkle with cheese and garnish with basil. Notes: For breakfast the next morning, I broke up the leftovers in a skillet, heated them up, poured in a couple seasoned whisked eggs, and scrambled it all together. Recipe from The Tomato Cookbook. Picture by Laura Flowers. I grew up in an Italian home eating polenta. I love this recipe- I've never tried it. I've enjoyed something similar to the topping, but never tried it over the polenta. I will do it. Thanks. I love polenta: the cheesier and tomatoier (wow, that's not a word!) it is, the better! I'm a "love polenta with anything" type of gal. This looks amazing! Basil, tomatoes, parmesan... what's not to love? Confession time, although I grew up in an Italian household, we never ate polenta. Yes, it's true, I was deprived :(. About your little food shaped cookbooks, haha... I have a Garlic shaped one. I guess I should crack it open sometime and give it a glance. Don't know if you got my response or not, but the answer to your question is Yes, I'd be honored!! My first name is Patricia. *GASP* You have a garlic shaped one??? I am so jealous now! That would be a great appetizer. This looks so good. Haven't had polenta, i know, i am a hick. Your photos always do it justice, always. I love tomatoes! This is such an easy fresh way to enjoy them. I will have to look up these funny shaped books. that will be perfect for you!...and this dish is fabulous! You make such tasty sounding dishes! Totally my kind of cooking :) I am so glad that I found your site!